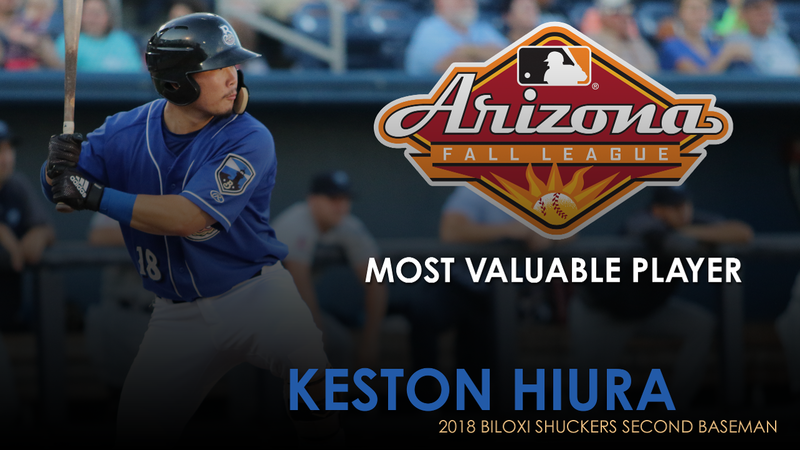 2018 Biloxi Shuckers second baseman Keston Hiura was named the 2018 Arizona Fall League MVP on Saturday. Hiura was part of the Peoria Javelinas that took home the 2018 Fall League Championship over the Salt River Rafters at Scottsdale Stadium on Saturday afternoon. Over the course of 23 regular-season games in the Fall League, the Milwaukee Brewers' number one prospect slashed .323/.371/.563 with six doubles, a triple, five home runs and 33 RBI. He led the Fall League in RBI and total bases while finishing tied for third in doubles and fourth in home runs. During his campaign with the Javelinas, Hiura hit safely in 17 out of 23 games, including 11 multi-hit games. The 2017 first-round selection recorded five RBI in two games, four RBI in one contest and three RBI in three separate games, and scored at least one run in 14 games. In the Arizona Fall League Championship Game, Hiura delivered a game-tying RBI single in the bottom of the ninth, sending the contest to extra innings. Peoria would go on to win 3-2 in ten innings on a walk-off home run by Atlanta Braves' prospect Braxton Davidson. 2018 Biloxi Shuckers Jon Olczak, Weston Wilson, Trent Grisham and Miguel Sanchez were also on the Javelinas, which was composed of prospects from the Brewers, Braves, San Diego Padres, Seattle Mariners and Tampa Bay Rays. Past MVP's from the Arizona Fall League include Southern League alumni Ronald Acuña Jr., Adam Engel and Kris Bryant, along with MLB All-Stars Nolan Arenado and Gleyber Torres. Created in 1992, the Arizona Fall League serves as an off-season "graduate school" for top prospects to showcase their talent for scouts, general managers and farm directors, while playing alongside high-end talent from other Major League teams. Shuck Nation memberships and group outings for the 2019 Biloxi Shuckers season are on sale now and are available for purchase by calling 228-233-3465 or visiting biloxishuckers.com.